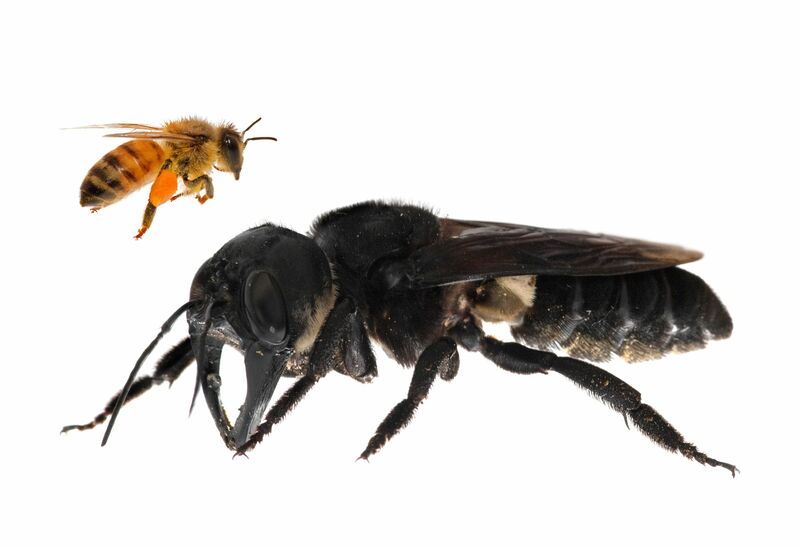 Lost to science since 1981 and thought by some to be extinct, Wallace's giant bee (Megachile pluto) has been rediscovered in Indonesia by an international team of scientists and conservationists. An international team of scientists and conservationists has announced the finding of what many consider to be the ‘holy grail’ of bee discoveries – Wallace’s giant bee. The bee (Megachile pluto) is the world’s largest, with a wingspan more than six centimetres (2.5 inches). Despite its conspicuous size, the bee has been lost to science since 1981. In January, a search team that set out to find and photograph Wallace's giant bee successfully rediscovered the species in the North Moluccas, an island group in Indonesia. The find resurrects hope that more of the region’s forests still harbour this very rare species. The discovery was announced today by the team, which as produced the first live photos and video of Indonesia's extraordinary lost bee. Dr Robson and Dr Glen Chilton, an honorary professor at Saint Mary’s University in Canada, joined with Eli Wyman from Princeton University and Clay Bolt, a conservation photographer from Montana, to successfully rediscover this bee. The team was supported by Global Wildlife Conservation, an Austin, Texas, based organisation that runs a Search for Lost Species program. 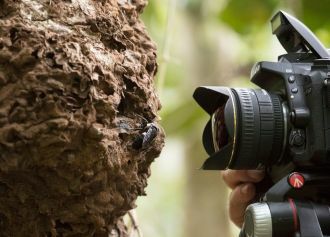 “It was absolutely breathtaking to see this ‘flying bulldog’ of an insect that we weren’t sure existed anymore,” said Clay Bolt, a natural history photographer specialising in bees, who took the first photos and video of the species alive after spending years researching the right habitat with collaborator and team member, Eli Wyman from Princeton University. The female giant bee makes her nest in active arboreal termite mounds, using her large mandibles to collect sticky tree resin to line the nest and protect it from invading termites. In hot and humid conditions, and sometimes during torrential downpours, the team observed dozens of termite mounds over the course of the search. It wasn’t until the last day of a five-day stop in an area of interest that the team found a single female Wallace’s giant bee living in an arboreal termites’ nest in a tree about 2.5 metres off the ground. The bee is named after Alfred Russell Wallace, the co-discoverer alongside Charles Darwin of the theory of evolution through natural selection. Wallace, an English entomologist, discovered the giant bee exploring the Indonesian island of Bacan. He described the female bee, which is about the length a human thumb, as “a large black wasp-like insect, with immense jaws like a stag-beetle”. The bee wasn’t seen again until 1981, when entomologist Adam Messer rediscovered it on three Indonesian islands and was able to observe some of its behaviour, including how it uses its mandibles to gather resin and wood for its nests. Since then, other teams have looked for the bee, with no luck. Although little is known about the bee, the species depends on primary lowland forest for resin and the nests of tree-dwelling termites, Mr Bolt said. In Indonesia, forest destruction for agriculture, however, threatens the habitat for this species and many others. Between 2001 and 2017, Indonesia lost 15 percent of its tree cover, according to Global Forest Watch. 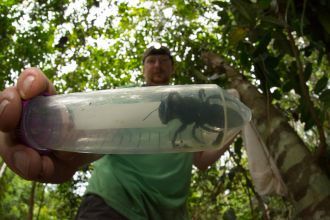 The team has already started conversations with Indonesian collaborators to look for Wallace’s giant bee in other locations – with the hope of eventually working together to develop a plan to strengthen conservation measures for the bee. A documentary film, In Search of the Giant Bee is now being produced by Vanessa Dylyn of Matter of Fact Media, in association with Glen Chilton. Honorary Professor Simon Robson from the School of Life and Environmental Sciences also holds an adjunct professorial position with CQUniversity.